One of my favorite ways to gauge market sentiment is to study which sectors led the way over the past quarter (I use the returns to the SPDR sector ETFs — data obtained from S&P’s Capital IQ). For the all-important first quarter of the year, comparing sector returns can also signal what type of a year it will be for stocks. 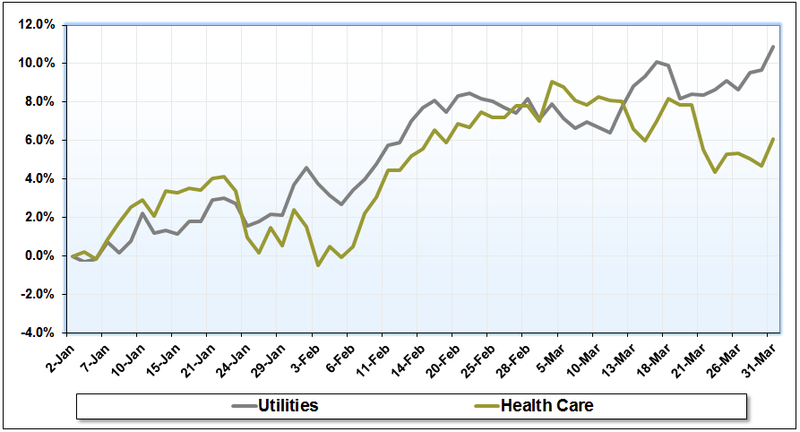 The first chart shows that two distinctly risk-off sectors, Utilities and Health Care, had the best returns for Q1, with 10.9% and 6.1% total returns, respectively. 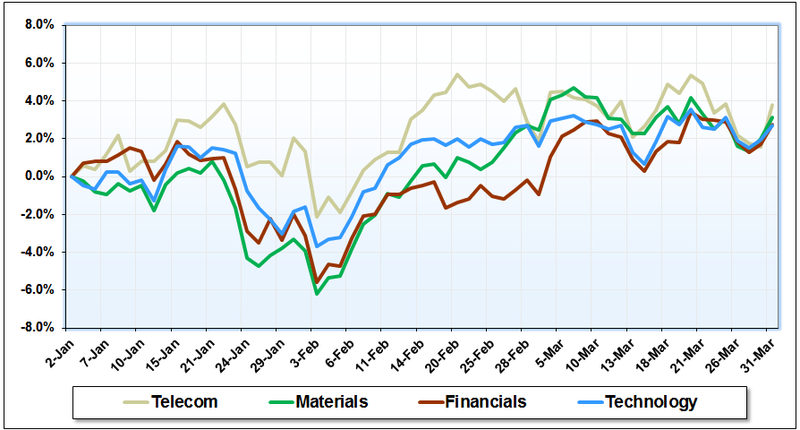 The middle of the pack sectors were Telecom (3.8%), Materials (3.1%), Financials (2.7%) and Technology (2.7%). These sectors delivered respectable returns, but suggest a more cautious outlook for 2014. If investors were more bullish, we would expect sectors such as these to outperform the safer Utilities and Health Care sectors. 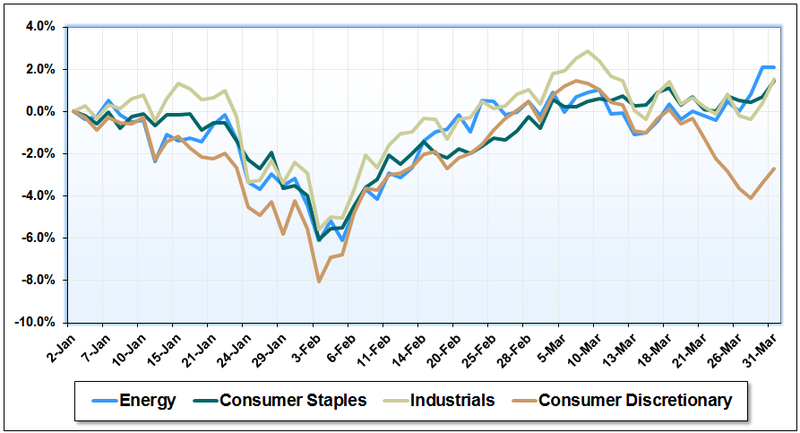 Bringing up the rear we have Energy (2.1%), Consumer Staples (1.6%), Industrials (1.6%) and Consumer Discretionary (-2.7%). The weak performance of the risk-on sectors (Energy, Industrials and Consumer Discretionary) reinforces the impression that investors waded into stocks cautiously in Q1 2014. A sluggish first quarter for stocks is not that concerning, given the 30% returns we saw in 2013. A quarter of consolidation is certainly warranted. If the risk-on sectors don’t play a bit of catch-up in April-May, however, especially Consumer Discretionary, Industrials and Energy, we may be in for yet another “sell in May and go away” range-bound summer. Stay tuned. Spot on with this write-up, I seriously believe that this web site needs far more attention. I’ll probably be returning to read more, thanks for the information! part of the estimate if you plan to use it for firewood. The workmanship of a tree service company always adheres to safety and precautionary measures while providing tree removal services. piece by piece, page by page, lead by lead. Assignment editors plan out news stories months in advance. You’ve probably heard about the so called “link farms”.